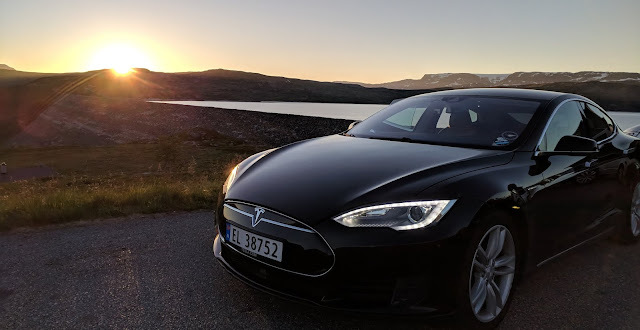 Exploring Norway by Train & Tesla! Norway, a country of stunning coastlines, impressive mountain ranges, extensive wildernesses, 24hr daylight and the world’s hardest sport climb. A place that generates 98% of their energy via renewable sources and is the world leader in EV adoption. A land of top-notch cinnamon buns and the hygge culture, creating spaces and moments of cosiness, comfort and contentment. 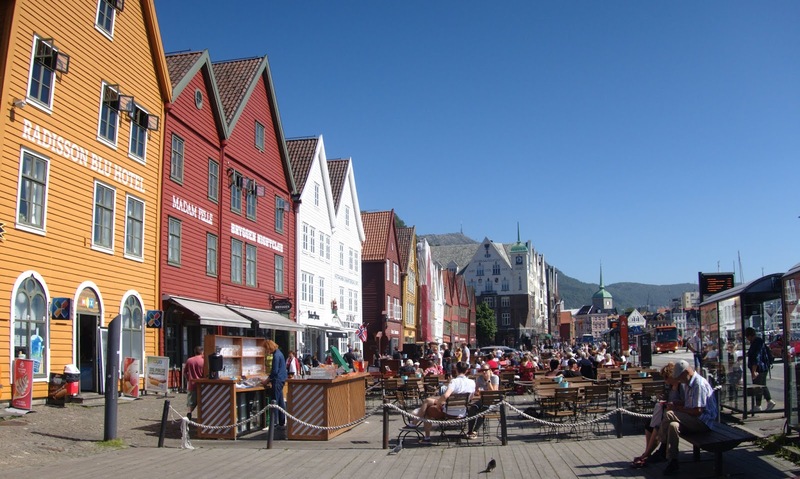 Visiting Norway is something that we had been talking wistfully about for the past few years. Our honeymoon seemed like the perfect excuse to finally splash out (we knew a trip to this amazing country would be more expensive than a typical European adventure). So this summer we made it happen. Paddling back after a day climbing at Flatanger, still baking hot and super sunny at 9pm! As with all our trips, we started by consulting the excellent train travel knowledge database that is The Man in Seat 61 and adapted one of his suggested UK-Norway schedules. We made our outward journey quite relaxed to allow us to have half a day in London and spend some time in Copenhagen (our top recommendation is going for a swim in one of their free, outdoor, harbour swimming pools, possible due to the work they have done improving the water quality over the last 15 years), before arriving in Oslo on the fourth day of travel. We opted to make the return journey more efficient, leaving Oslo on a Sunday evening and arriving home in North Wales early on Tuesday evening. 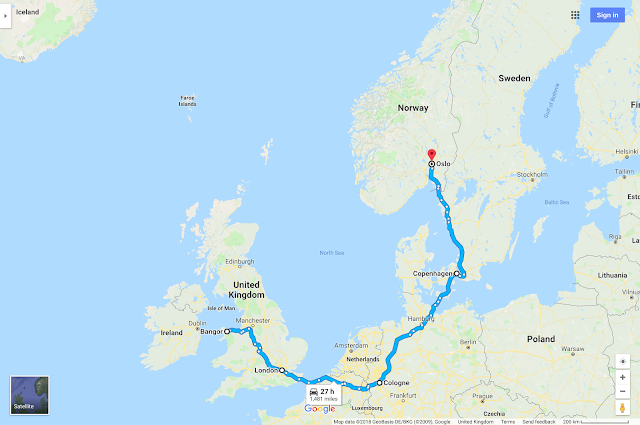 The return journeys for two people, plus 3 Airbnbs (Cologne and Copenhagen on the way out, and then just Cologne on the way back because we took a sleeper train) was near enough £1000 in total (£250 one person one way). Our decision to go was relatively last minute, especially for the train ticket world. Booking tickets more than a month in advance would definitely help reduce this cost! The journey was smooth and pleasurable. European trains are so spacious in comparison to UK trains, with ample luggage storage, which is especially appreciated when you are travelling with climbing, mountaineering and camping equipment, plus other ‘essentials’ such as red wine, nuts and pesto (we had been warned of the high prices in Norwegian supermarkets for these items!). 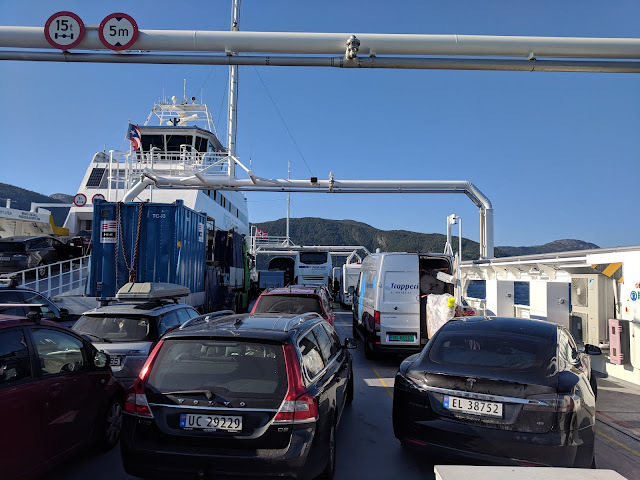 Leaving Germany for Denmark marked the start of new train territory for us, and was rather exciting as it involved going on a ferry from Puttgarden in Germany to Rødby in Denmark. The train boards the ferry, then passengers go upstairs for the crossing to eat ice creams and drink coffee on the deck, enjoying the views before the ferry docks on the other side and the train continues on its journey. The bridge connecting Denmark to Sweden was another pretty spectacular section and as soon as we entered Norway, our books dropped to our laps as we watched the forests and lakes go by in the evening light. The perpetual sunset was still in full force when we arrived in Oslo at 10.20pm. Buying 24hr tickets on Oslo’s public transport app we hopped on a tram, then got a ferry over to Nesodden, a peninsular fondly known as ‘the island’ to its residents, where we were staying with Amy’s friend Anja and her partner Daniel. Getting off the bus and walking to their apartment at 11.30pm felt like it should be 8pm. The next day we went to pick up our hired Tesla, our transport and bedroom for the trip! It had always been the dream to do our Norwegian road trip in a fully electric Tesla - Norway being a country with such an extensive supercharging network, and so much renewably generated energy. We had been prepared to pay a bit more for the privilege, so it was a pleasant surprise to discover that through using the P2P website Leiting.no we could hire this 2014 Tesla model S at the same price as a Ford Focus from a traditional hire company! 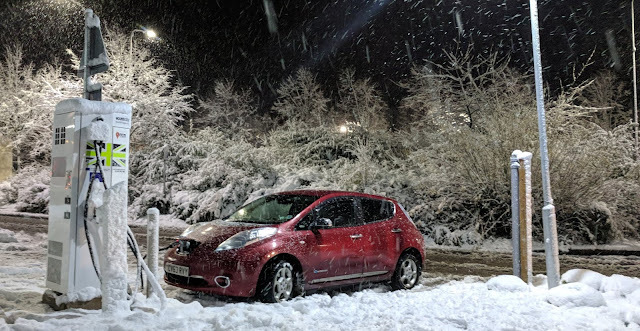 Coupled with the road tax exemptions and free public parking for driving an electric vehicle, plus the free fuel from supercharging, it meant choosing a Tesla made complete financial as well as environmental sense. 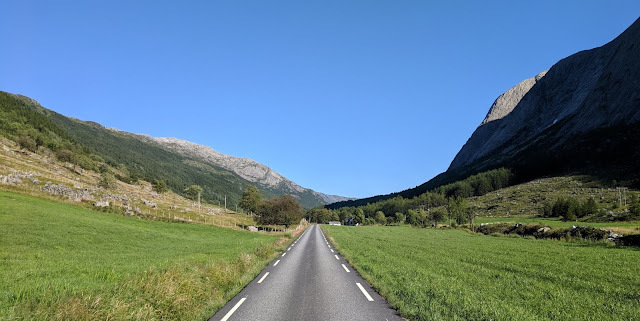 Click here for a full-screen Google Map of our trip around Norway. Dealing directly with the car’s owner was a great experience for us. He was super helpful and went above and beyond to help us out. When we needed a Norwegian mobile phone number to make use of a ‘start a rapid charge via text’ option (after the charging company’s app didn’t accept our British address or credit card and the helpline wasn’t manned over the weekend) he did this remotely for us. However, we mainly charged at Tesla Superchargers, which were all very smooth experiences. It was incredible to see bays of 30 plus superchargers with two thirds usually occupied. Having poured over YouTube videos of people sleeping in their Teslas, we opted to buy an inflatable double mattress that would absorb the step between the folded rear seats and the boot. It took a while to fine tune the exact level of inflating to do, but we got there. Too much and the bed ‘burst its banks’ going up at the sides and making a dip in the middle, too little and you could feel the floor of the car when sleeping on your side. An electric air bed pump with 12V plug worked a charm, and having a mattress with the air vent/plug in the top centre made it easy to access. Using the Tesla "Keep Climate Control On" setting kept the interior of the car warm in the night and cool when the sun hit in the morning. 19.5C was our sweet spot temperature, and consumed on average 3-5kWh per night, decreasing predicted range by 15km - 30km (not much when starting with over 400km), depending on outside temperature and how long we slept for. Being able to have the windows closed and climate control on was also amazing for soundproofing. Reversing the parcel shelf to make a blackout for the rear windscreen was great for privacy and helping to sleep in 24hr daylight. We had a silver foil screen for the front windscreen and towels/clothing trapped in windows worked well as curtains for the door windows. Parking on a slight angle (frunk downhill) compensated for the upwards tilt of the rear seats to give a flatter bed. Having a hanging pocket system strung behind the two front seats was useful for storing phones, kindles, glasses etc. 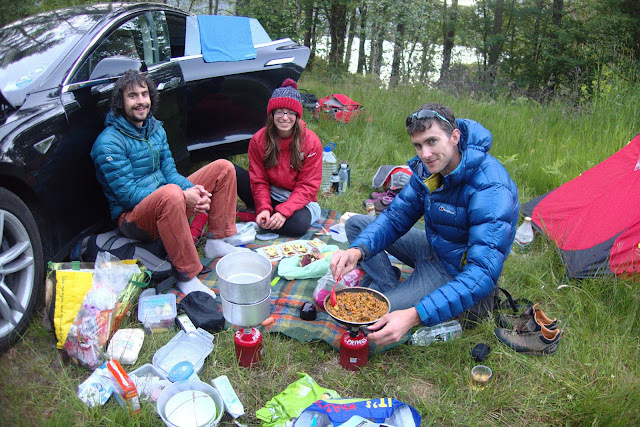 We kept food and cooking gear in the frunk, which meant breakfast wasn’t dependent on us getting up and packing the bed away. Our friends could get access to coffee, even if we were having a lie in! 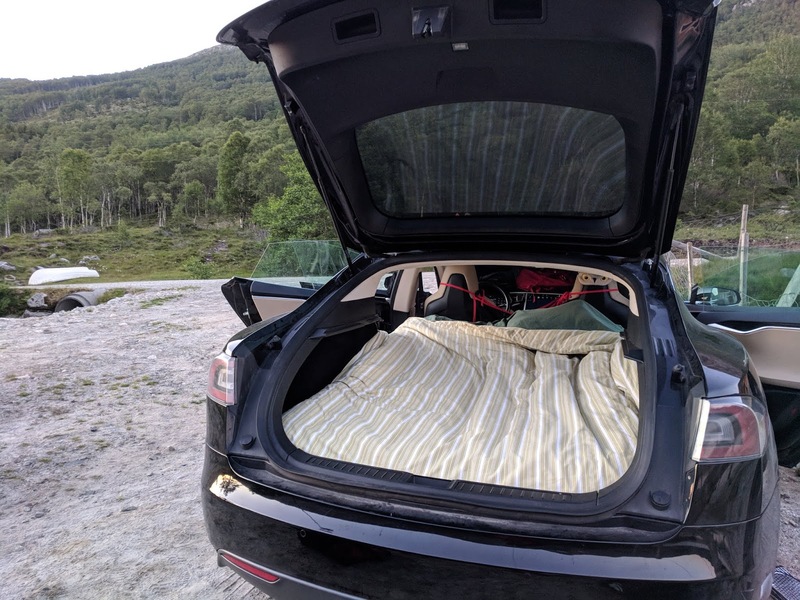 The Tesla mobile app allowed us to adjust the temperature during the night, lock the car and open the funk / trunk in the morning. 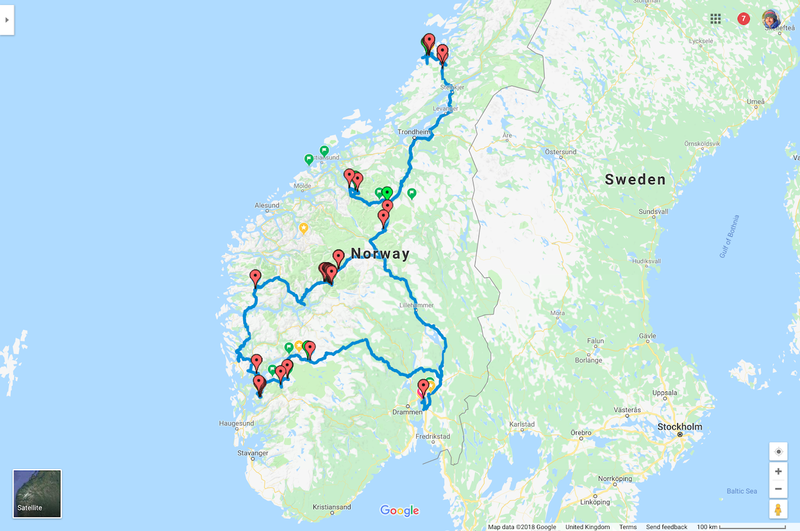 Norway has some truly epic wild car camping spots! Here's a map/list of where we stayed. We had unconventionally invited our friends Chris and Jen on our honeymoon! After a great trip with them in the Dolomites in 2012 we had been trying to coordinate another trip together for years. They were sleeping in a tent, so all of our overnight spots were good for a tent as well as a vehicle. Norway has a right to roam. You can put up a tent for the night anywhere in the countryside, forests or mountains (even on private land) as long as you keep at least 150m away from the nearest inhabited house or cabin. The 150m rule also applies to camping cars and caravans. If you want to stay for more than two nights in the same place, you need to ask the landowner's permission, except in the mountains or very remote areas. 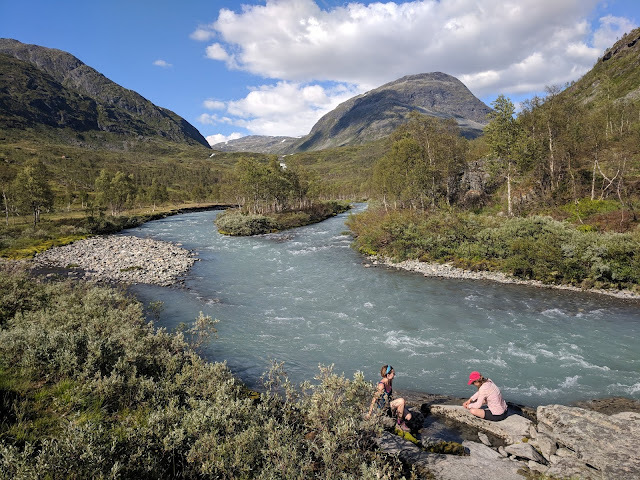 None of us had been to Norway before and our itinerary tried to find a balance of accommodating everyone’s activity preferences, exploring the country and spending quality time in areas without always being on the move. Tricky, but I think we managed pretty well. Essentially a long walk from a very expensive pay and display car park (500NOK/day) to a photogenic rock! This was a last minute decision and we picked it as a destination to aim for on our first day driving west. Through the power of instagram it has become a very touristy thing to do. We managed to mostly avoid the crowds by starting late and getting to the rock around 5.30pm (if you are doing this it could be worth asking people who are leaving the car park when you arrive whether you can buy their ticket at a reduced price as it’s valid for 24hrs). Though we did get our picture postcard image of Norway, overall we would not highly recommended it. It’s a 27km round trip with an uninspiring slog up a tarmac road to start, though there are stunning views later on. Probably best enjoyed as a fell run off-season. Inspired by these guys who described the place as the smaller Nordic brother of Yosemite, we next headed to Uskedalen. The beautiful valley and waves of granite did not disappoint. 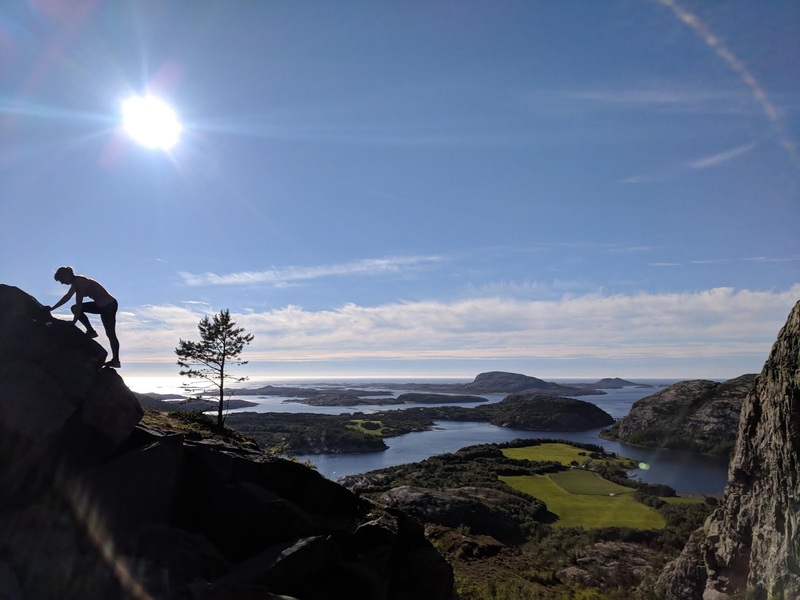 We did a two-star Norwegian grade 4 route called Kolkjereryggen/Akslo Ridge, that went from the valley floor and topped out on the plateau below Ulvanosa (about 1000m ascent) via an awesome, long granite ridge. We walked down a marked tourist trail that took us to the north end of the valley. I took one for the team and did the link up section, running back up the valley to pick up the car. The harder routes on the walls looked amazing, we didn't have time to climb anything else, here’s a video showing what the harder climbing is like, I would love to go back. The wettest city in Europe! Apparently, the rainiest city in Europe, though the sun shined for us! We parked on a residential street near Meyermarken garden, a 10min stroll to the harbour via nice quiet back streets. After reading about it, we were excited that we could legitimately use it on our route from Bergen to Jotunheimen National Park without a special detour. There are 2 other (non electric) ferries in the fleet that do the crossing, so check the timetable in advance. 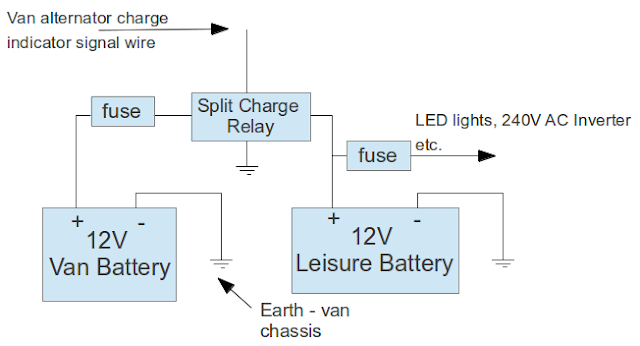 For us in 2018, The Ampere was coded as ‘B’ in the timetable. Being in an EV we got a discount for the crossing. A national park full of the big mountains! Arriving in Jotunheimen in the afternoon we walked 16km into the park to Skogadalsboen, an amazing hut part of the DNT network. Amy had researched and taken a fancy to this. 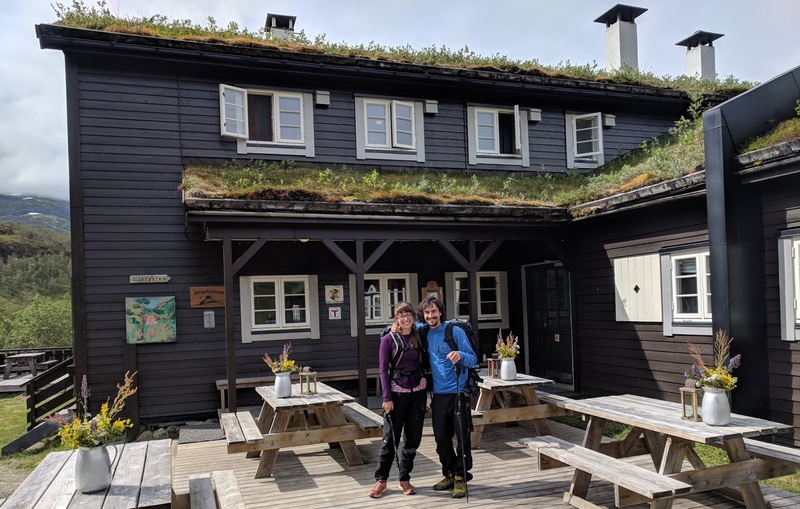 Norway isn’t cheap, and staffed mountain huts are a whole other level of expensive, but if you can accept and switch off to this for a night, it is definitely a cool experience. Cocktails and a cosy candlelit dinner in the mountains was pretty special. 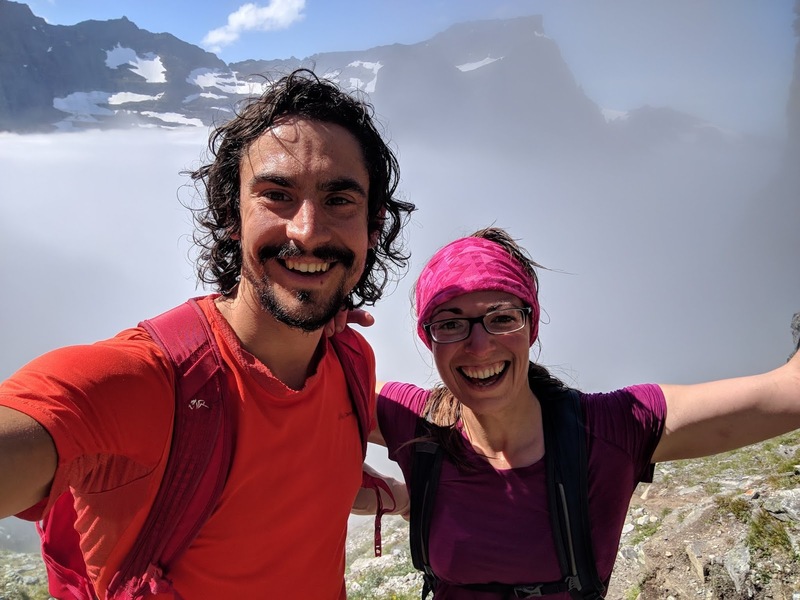 The next day was cool and cloudy (a first for the trip), Chris and Jen went up Fannaråken (2068m) and Amy and I decided to run 14km up a different valley and then hitched the linking road back to the car. 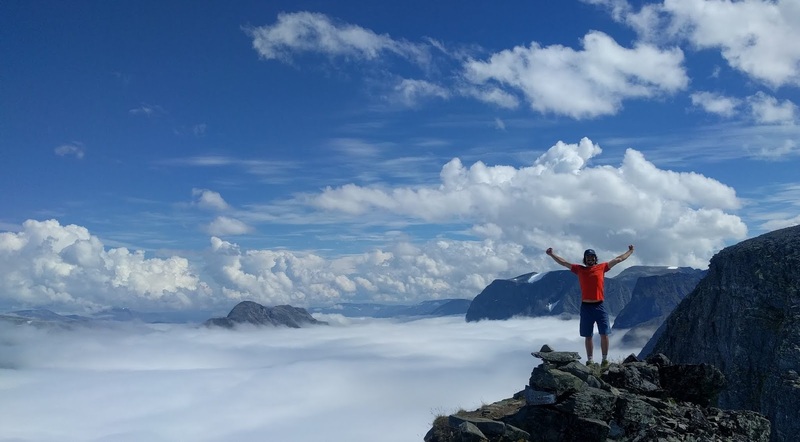 UKC did an inspiring article on the ridge climbs in Jotunheimen. 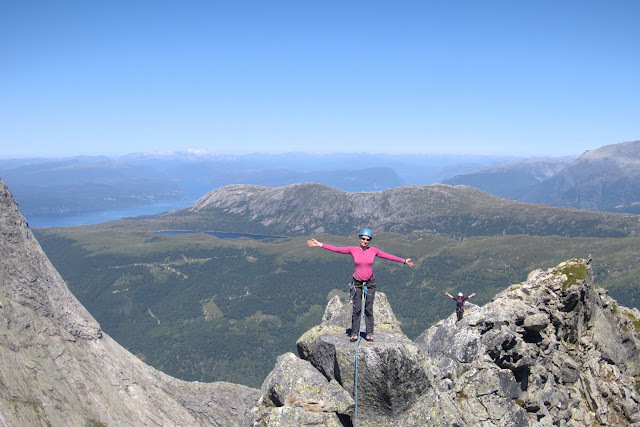 We had all been considering Storen by the North ridge, a Norwegian 3+ route, but Amy and I felt we hadn’t been moving together fast enough on Asklo Ridge to take on this bigger outing (guidebook time of 17hrs). 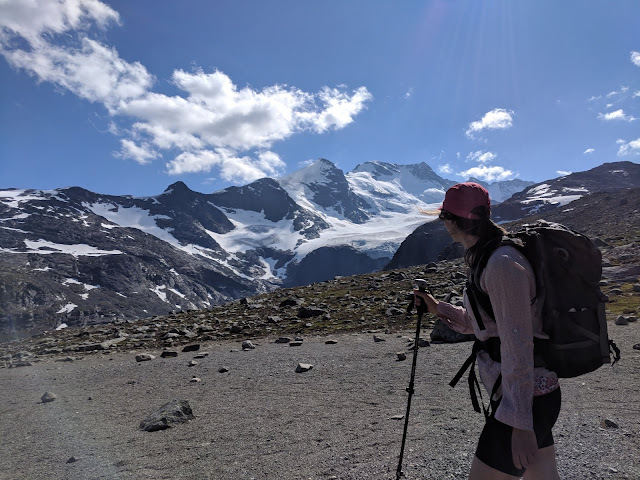 Asklo had been that awkward/blurred terrain of scrambling with sections of easy climbing up to Severe, which Amy would normally pitch on trad multi pitch days in the UK, but here we needed to be comfortable moving fast together with minimal gear between us. To anyone on road bikes or even just driving, the 55 along the north of the park in an amazingly scenic road with good tarmac! Home to the hardest sport climbing route in the world. 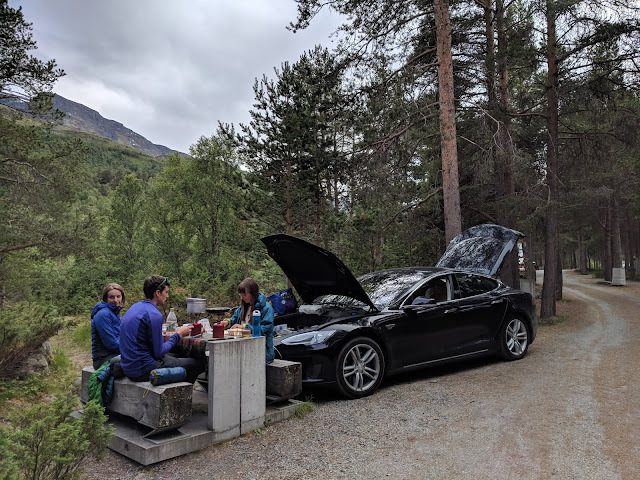 We stayed at Flatanger Camping campsite, a happy mistake because although it wasn’t the closest to the crag it was great value and had excellent facilities! We took advantage of their indoor lounge and cooking area (complete with an oven - very exciting after a couple of weeks cooking on a gas camping stove) by making pizzas and having some film nights. The campsite owners were very friendly and even had canoes and boats to hire, fantastic for exploring the surrounding fjords. The climbing at Flatanger was excellent, there is lots of climbing at all grade ranges on fantastic rock. I think the highlight for me was Berntsenbanden, a bit like a 7c version of Vector at Tremadog. Sport climbing on steep granite was really cool! The most beautiful valley in Norway. Our plan was to break up the journey back to Oslo by climbing Innerdalstårnet, a 1452m peak in apparently the most beautiful valley in Norway. Driving through sheets of rain to Innerdalen, we wondered whether our weather luck had run out. Waking up in misty cloud, Chris and Jen set off optimistically, while Amy and I slept longer, hoping the cloud would clear and planning to catch them up by fell running. Midday came, the cloud hadn’t lifted but we set off anyway, hoping we would be able to catch a glimpse of the stunning scenery at some point! At 1200m the miracle happened, we rose up above the cloud to climb the 200m scramble section (think Tryfan North Ridge) in glorious sunshine with a spectacular cloud inversion all around. The views were all the more special for the delayed reveal. Dropping back down into the mist wasn’t such a joy, but we finished the day with coffee and freshly baked waffles and cinnamon buns at Renndølsetra, highly recommended.